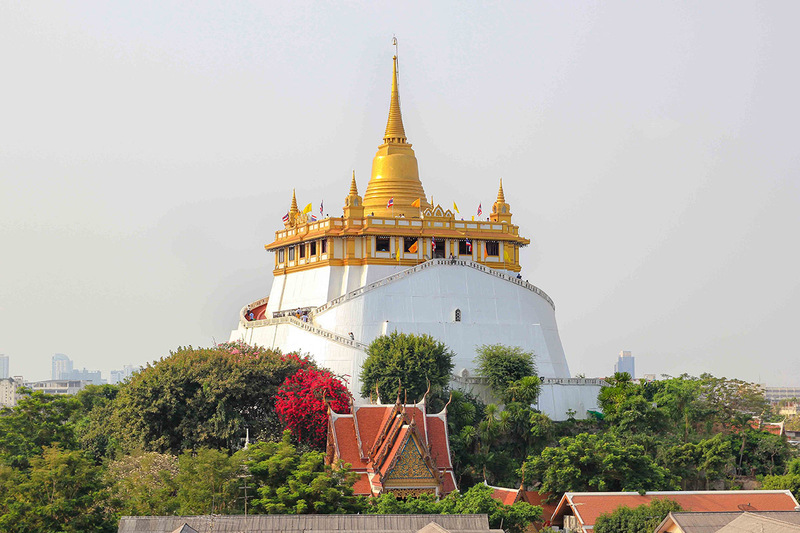 The Wat Saket temple, or better known as the Golden Mount in Bangkok, is a Buddhist temple in Thailand located in the district of Pom Prap Sattru Phai. This impressive temple complex is certainly one of the most beautiful sights in the old town of Bangkok. 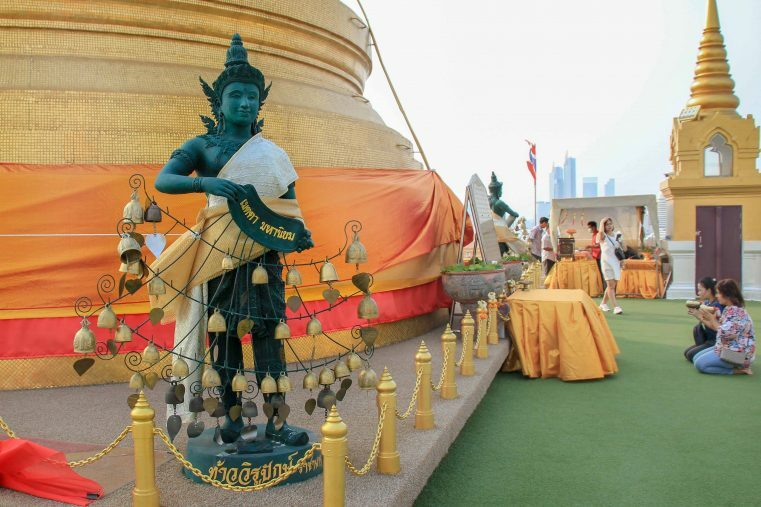 A 318 steps pathway leads up to a marvellous golden Chedi and from the top you will get spoiled by scenic ambience. 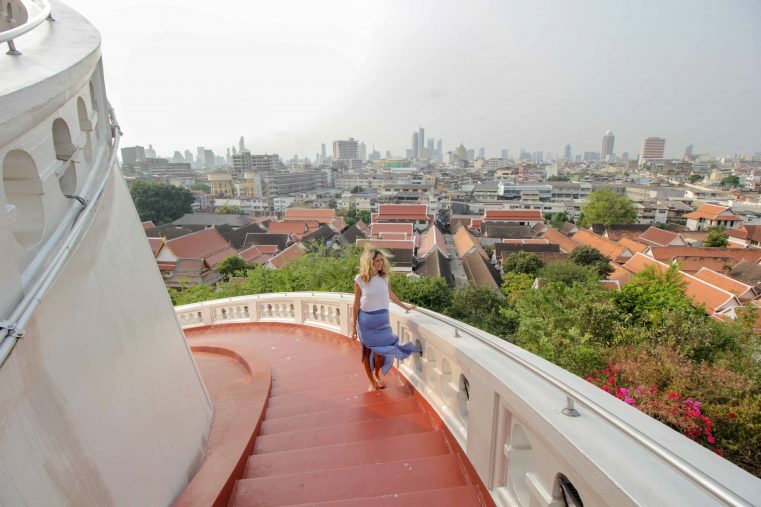 Here, from the terrace you can enjoy a breath-taking panoramic view across the rooftops of Bangkok. 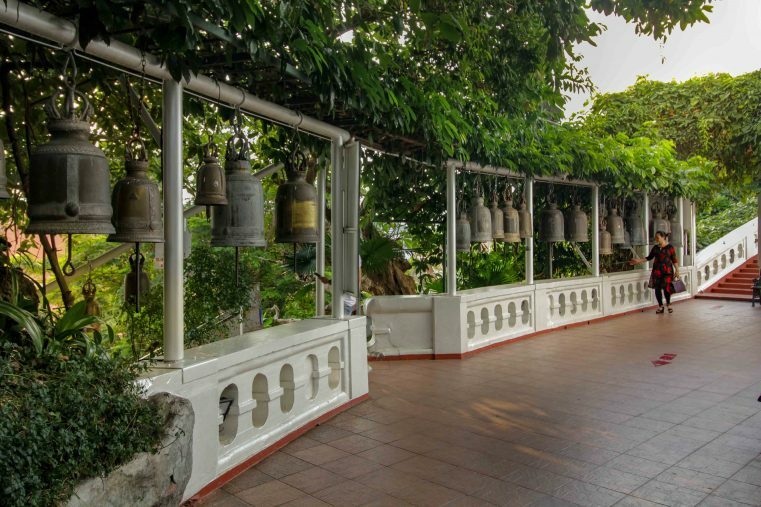 The ascent to Wat Saket is also worth the effort; beautiful bells, mystical statues and the many details make this temple really worth a visit. 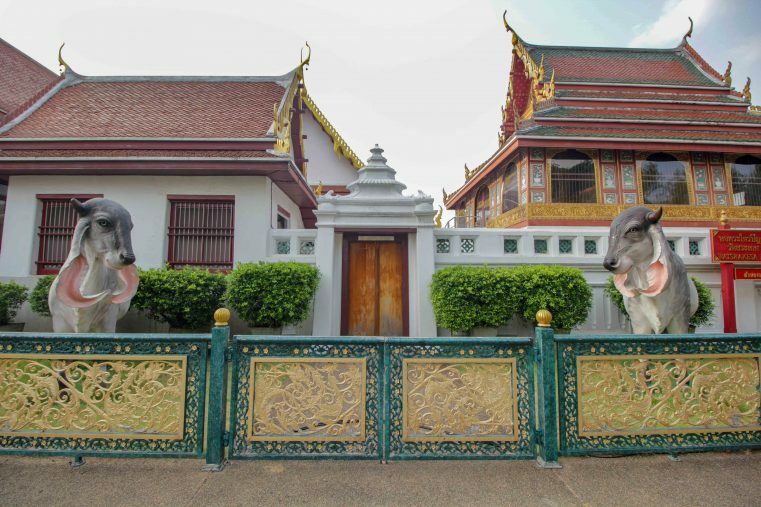 In this blog guide we have summarized the most important information about transport, opening hours and entrance fees for the Wat Saket. In addition, you get some amazing insider tips for an unforgettable visit to the Golden Mountain! 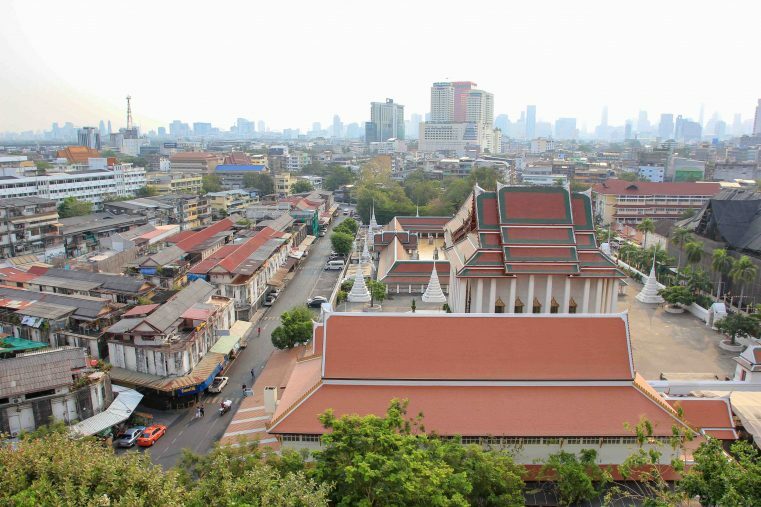 The Wat Saket in Bangkok is located at a height of 79 meters and in order to reach the top of the temple 318 steps have to be climbed. Honestly, it`s not that tiring, the low steps are easy to walk. The way up is really idyllic! Take some time for the walk and enjoy the beautiful surrounding. 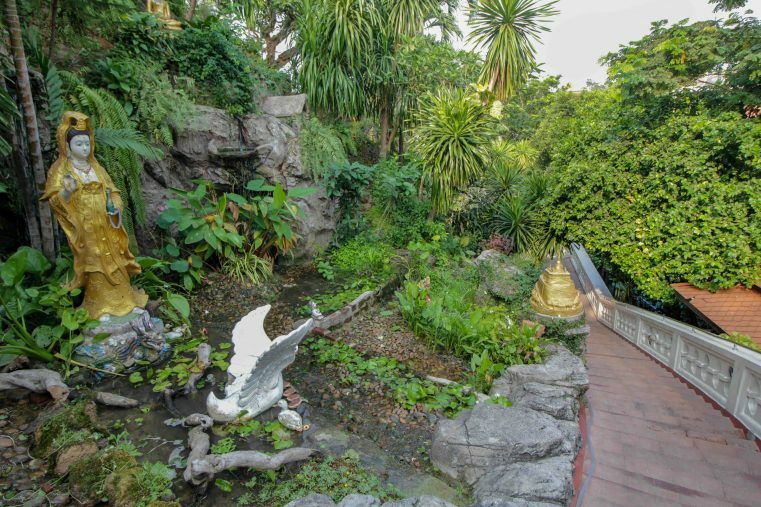 You will pass exotic plants, beautiful Buddha statues, small streams and also some bizarre figures. 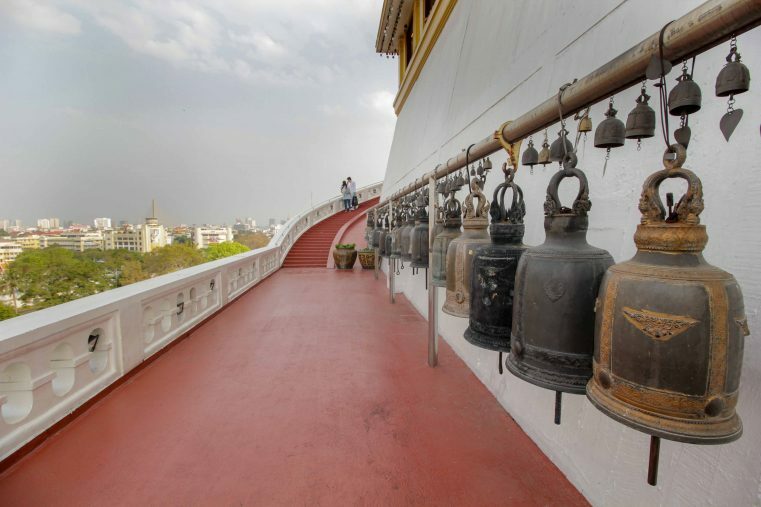 Especially interesting are the bells of Wat Saket, which are part of the prayer ritual. At the top, the mood is just magical! Such an amazing place of peace and quietness. Only the small bells ring in the wind and only the monks’ prayer ceremonies can be heard out of the speakers. 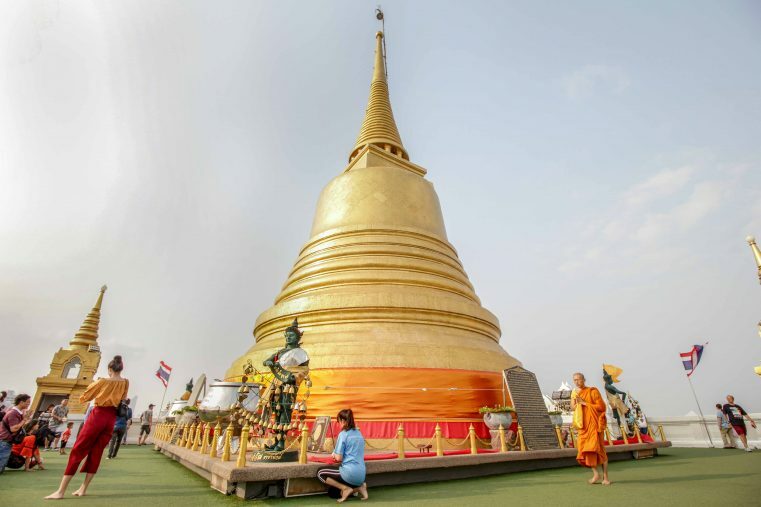 A large golden chedi is located right in the middle of the upper platform and you can watch the faithful as they circle them with their offerings. The meditative silence invites to linger for a while, so make sure you take your time for the visit. Without a doubt, the absolute highlight of the temple is the brilliant view all over Bangkok. From here you can enjoy a 360-degree view over the rooftops of the city. Tip: This viewpoint is especially popular in the evening. From here you can experience unforgettable sunsets! The history of Wat Saket goes back to the time of the Ayutthaya Empire from 1350-1767. Once the temple was located outside the city walls and in the 18th century it was used as a cremation site and later as a dumping place for the approximately 60,000 plague victims. Because of the bad smell in that dark era, people made a large turn around the temple. It was not until the reign of King Chulalongkorn that the Golden Mount was completed. Today, this temple is an important pilgrimage site for believers and undoubtedly one of the most popular temples in Bangkok. Every year, during Loy Krathong, the Wat Saket Temple hosts a huge temple festival in November. During this time, the golden chedi is covered with a red cloth and candle lights line the temple entrance. At the foot of the Golden Mount there are many stands and food stalls. From early evening until late at night believers come to attend the festival at Wat Saket. During that time, you should visit the temple early in the morning, as it will be full later on! The dress code at Wat Saket is not quite as strict as in other temples in the city. Since it is a Buddhist place, you should still respect the rules and pay attention to your clothing. Sleeveless T-shirts, miniskirts and shorts are not welcome here. The shoes can be kept on inside this temple. 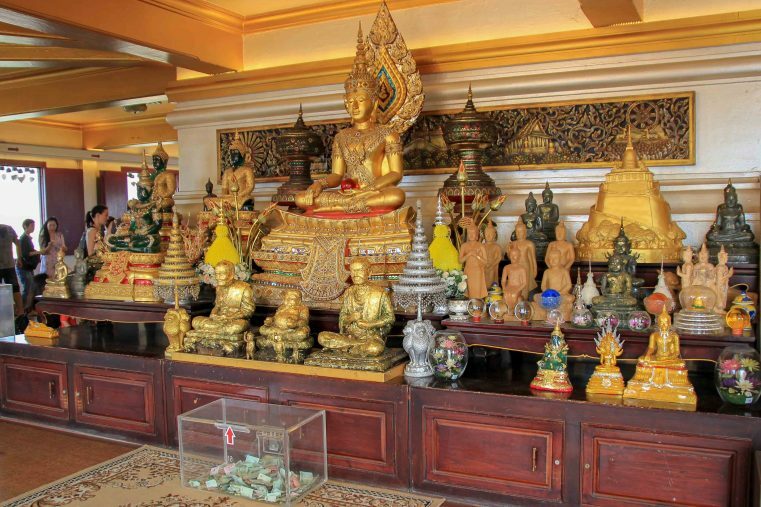 The opening hours of Wat Saket are from 7:30 am to 7:00 pm, all week from Monday to Sunday. 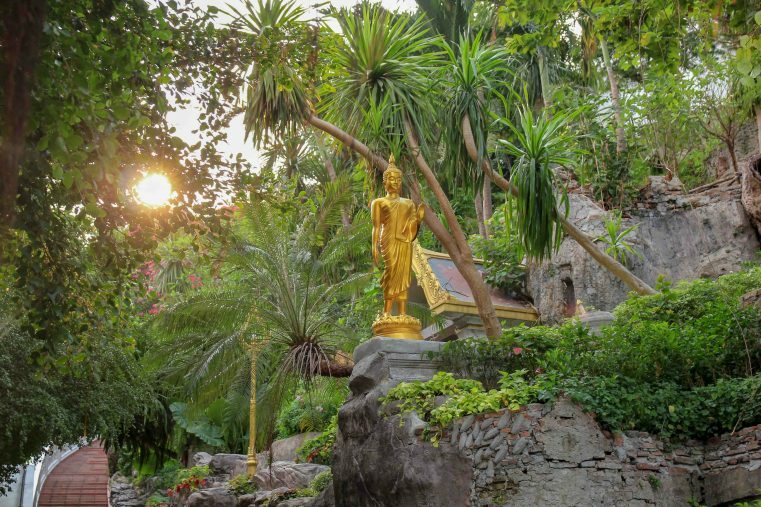 The entrance fee for tourists is 50 baht per person and must be paid before the ascent of the temple. Tip: The visit is recommended very early in the morning or in the late afternoon for watching the sunset. Closing time is at 7:00 pm so you will have enough time to enjoy the evening ambience. Getting to Wat Saket is uncomplicated to organize. The temple is located in the historic centre of Bangkok, just 2 km walk from Khao San Road, but cannot be reached by metro or BTS. Also, you could get there by public bus or with the inexpensive taxis. Another option is to get to Wat Saket by boat: Take the stop at the pier (Phanfa Bridge Station) at the Golden Mount Temple.